Shiite Popular Mobilization Forces (PMF) celebrate on the outskirts of Kirkuk, Iraq, Oct. 17, 2017. Iraqi Shiite paramilitary groups have deployed to the frontier to back up border guard forces who came under fire from within Syria over the past three days, one of their commanders said on Friday. There was no immediate word on who opened fire from Syrian territory, but forces arrayed against Islamic State in Iraq and Syria expect the group will resort to guerrilla warfare after losing its urban bastions earlier this year. “After several Iraqi border guard positions came under several attacks by missiles, and backup from security forces was late, the 13th brigade of the Popular Mobilization Forces (PMF) was deployed and targeted the origins of the launch,” PMF commander for west Anbar, Qassem Mesleh, said in a statement. The PMF is an umbrella grouping of mostly Iran-backed and trained Shiite militias that formally report to Iraq’s prime minister but are separate from the military and police. Iraqi Prime minister Haider Al-Abadi speaks during a joint news conference with French President Emmanuel Macron (not seen) at the Elysee Palace in Paris, France, Oct. 5, 2017. Sunni Muslims and Kurds have called on Prime Minister Haider al-Abadi to disarm the PMF, which they say are responsible for widespread abuses against their communities. 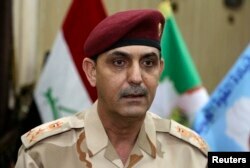 An Iraqi military spokesman confirmed the deployment. Brigadier General Yahya Rasool told Reuters it was temporary, however, and “very normal” because it was the PMF’s duty to back up government forces. The PMF were officially made part of the Iraqi security establishment by law and formally answer to Abadi in his capacity as commander-in-chief of the armed forces. 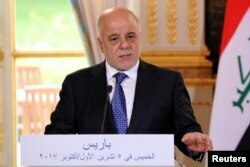 Abadi has said the state should have a monopoly on the legitimate use of arms. Iraqi forces on Dec. 9 recaptured the last swathes of territory still under Islamic State control along the frontier with Syria and secured the western desert. It marked the end of the war against the militants, three years after they overran about a third of Iraq’s territory. Brig. Yahya Rasooli, an Iraqi joint command spokesman, speaks during an interview with The Associated Press in Baghdad, March 28, 2017. Rasool, the military spokesman, denied backup to the border guards had been late. “The primary responsibility for the borders lies with the border guards and the army, however,” said Rasool. He said Iraqi forces coordinate with both the Syrian army, which is backed by Russia, Iran and Iran-backed Shiite militias, and the U.S.-backed alliance of Kurdish and Arab militias known as the Syrian Democratic Forces opposed to Syrian President Bashar al-Assad. He said parts of Syria — including many areas on the border with Iraq — were still under Islamic State control.